Ken Dawson is a Consultant Neurologist, working mainly as a General Neurologist in the Aneurin Bevan University Health Board area and also at the University Hospital of Wales, Cardiff, where he also runs specialist clinics for dystonia. He is Neurology Lead and Co-Director of the South Wales MND Care Network and provides neurology input for the local MND clinics covering Gwent and South Powys. Ruth Glew RGN, RMN, is a Registered Genetic Counsellor, DipN(Lond), BA, PGDip Therapeutic Counselling (CBT). Prior to taking up her post as Lead Care Co-ordinator for the South Wales MND Care Network in August 2012, Ruth has worked as both a general and Mental Health Nurse within the NHS. She then became a Genetic Counsellor in 1992 with a particular interest in Neurological conditions working in Southampton, Oxford and Cardiff. South Wales with a mixed rural and urban population of 2.3 million, areas with high levels of deprivation and a relatively aged demographic profile, has a known population of people with motor neurone disease (pwMND) of approximately 170 – 200. Historically, there has been patchy and in areas poorly coordinated care for pwMND. The model for specialist MND care provision in the UK has been largely through specialist regional Care Centres. In South Wales this effectively reached only half of the MND population, who often had to travel long distances to access specialist expertise if available. It allows for significant existing expertise across a range of specialities and professions to be incorporated alongside increasingly strong local teams, resulting in improved services. Early palliative medicine input is a central feature.The service aims to be proactive not reactive, allowing for timely interventions such as feeding via gastrostomy and establishment of non-invasive ventilation and avoidance of emergency situations, which have often resulted in lengthy inpatient admissions. Delivery of care makes use of existing health and social care teams and is cost neutral in terms of those local teams involved. 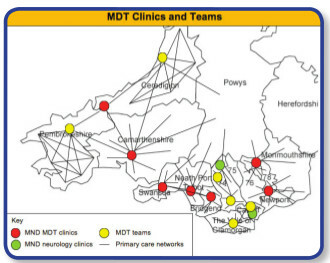 The network has combined funding via a grant from the MND Association with existing NHS funding already in place for MND service provision and has led to the establishment of Care-Coordinator posts based in the South-East and South-West hubs, in Cardiff and Swansea respectively, one of whom is also Occupational Therapist. In future years, full funding for these posts will be taken over by the South Wales Health Boards. Early tasks for the network staff included ascertainment of the existing case load and a baseline audit of services and patient experience. Once a patient is diagnosed with MND, they are referred to the network personnel and receive an early initial Care-Coordinator assessment at home and are discussed at a local care network MDT meeting. At least three monthly MND MDT clinic attendances take place, unless the patient is too unwell to travel, in which case care at home with regular telephone follow-up or home visits take place. At a single clinic visit, for many although not yet all of the newly established local clinics, there is access to expertise, including a Neurologist, Palliative Care Physician, Respiratory Medicine Physician, Physiotherapist, Occupational Therapist, Speech and Language Therapist and Dietician, as well as input from the Care Coordinators. End of life issues can be gently introduced as a matter of routine. To facilitate an open and integrated approach to patient-centred care, we have developed a cross-organisation, all Wales electronic patient record (EPR) system allowing data to be entered and accessed by any healthcare professional from any location. The service provided by the South Wales MND Care Network has the potential to be a useful model for shared learning & development in other areas of the UK with widely dispersed populations.We believe that this model of care has benefits for both pwMND and professionals involved in their care. We are presently developing an outcome framework to further evaluate the impact of this approach on health care. Although still a relatively new development, the feedback for the service has been very positive. Acknowledgements: MND Association and South Wales MND Association branches.